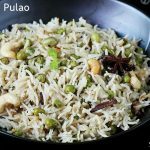 Peas pulao recipe or matar pulao recipe with video – A simple aromatic one pot dish that can be made just under 30 minutes. 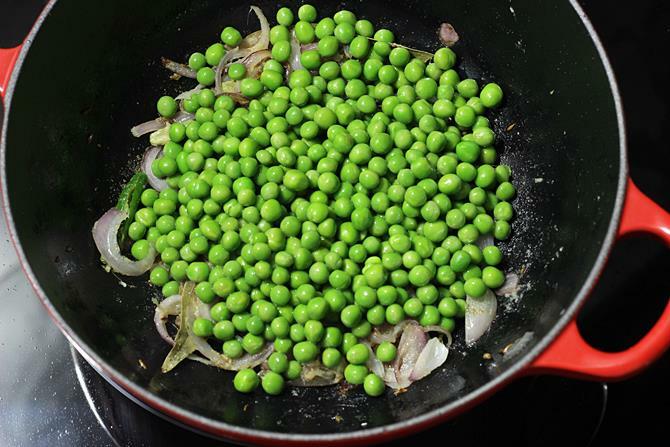 Green peas are known as matar in hindi and Pulao is a Indian rice pilaf . This matar pulao is made with basmati rice, whole spices, herbs & of course green peas as it is the star ingredient of this recipe. 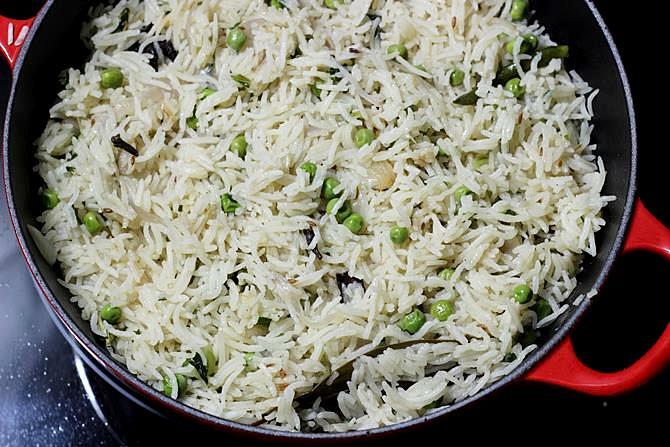 This recipe of matar pulao is the way my mom would make for us mostly when fresh peas were in season. Green peas are a seasonal legume and the markets are flooded with fresh pea pods during the winters. 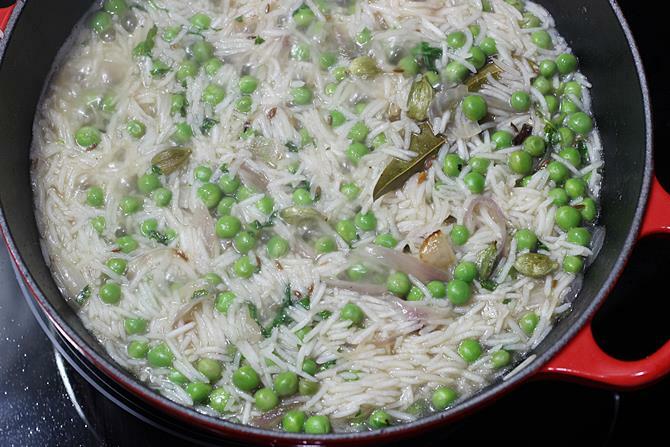 But I make peas pulao with frozen peas as I am rarely accessible to the fresh pods. This is one of the dishes I make at least once a week as my boys love it. It goes very well even in school & office lunch box. 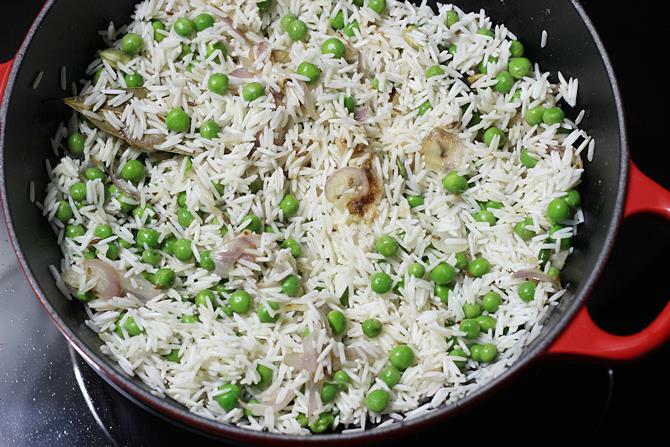 I never fail to make peas pulao when we have guests home and plan for a elaborate menu. Since there is no chopping of any veggies it is really quick to make this. Peas pulao goes well with a yogurt raita or a nice veg curry like veg kurma, restaurant style paneer butter masala or paneer makhani or non-veg gravy. I made this peas pulao, a simple chicken curry and a carrot raita for our lunch during the last weekend. 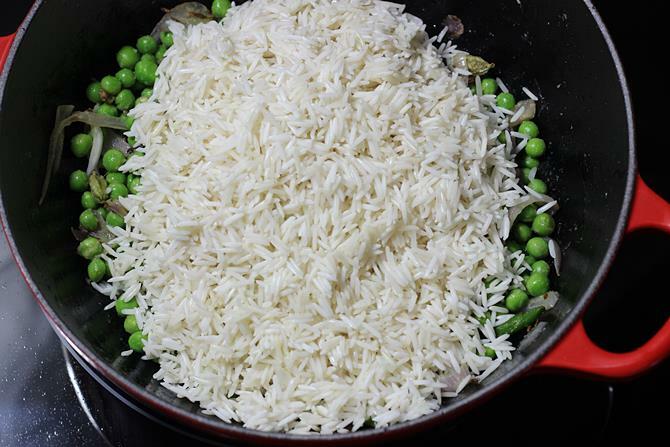 Usually basmati rice is used to make matar pulao but any premium quality rice can also be used. If the green peas are not tender or young, then you can also precook them for 2 to 3 minutes, drain and add in the recipe here. mint the main herb used to enhance the flavor. However it can be replaced with coriander leaves. Adjust the water quantity as needed depending on the kind of rice used. I use aged basmati rice. 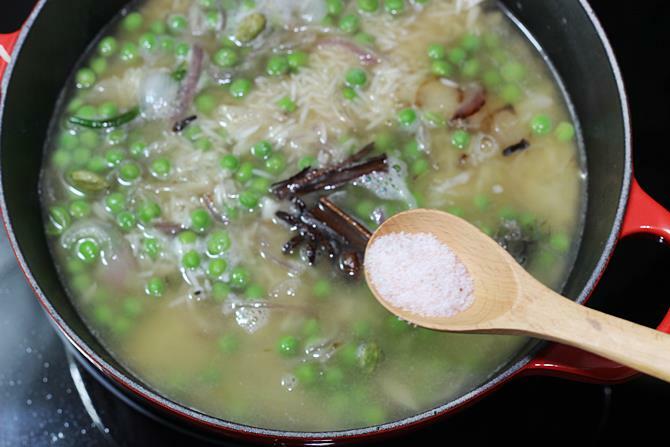 peas pulao can be made in a pot, cooker or in a instant pot. I have instructions included for all the 3 methods. 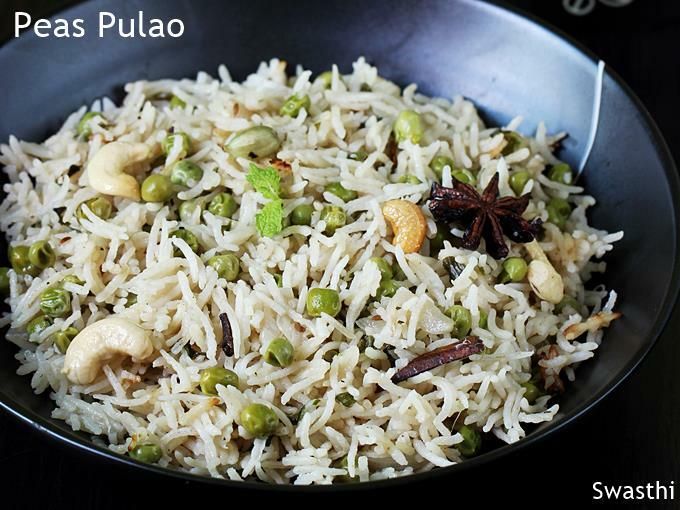 Matar pulao or peas pulao is a aromatic one pot rice made with peas & rice. Instructions for regular pot, instant pot & traditional cooker. Wash and soak rice for at least 30 mins. If you are in a hurry you can soak it in hot water for 15 mins and use up. Discard the water and drain to a colander. Slice the onions (if using) and mint leaves. Slit the green chilies. Make the ginger garlic paste. Set them aside. Heat ghee or oil in a pot or cooker. 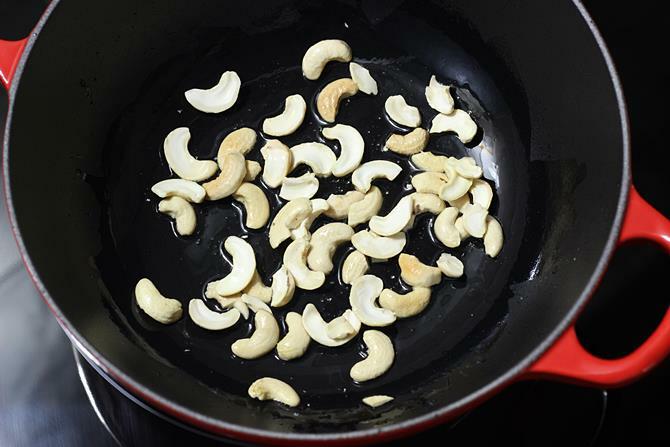 Saute cashews if using. When they turn golden set them aside. 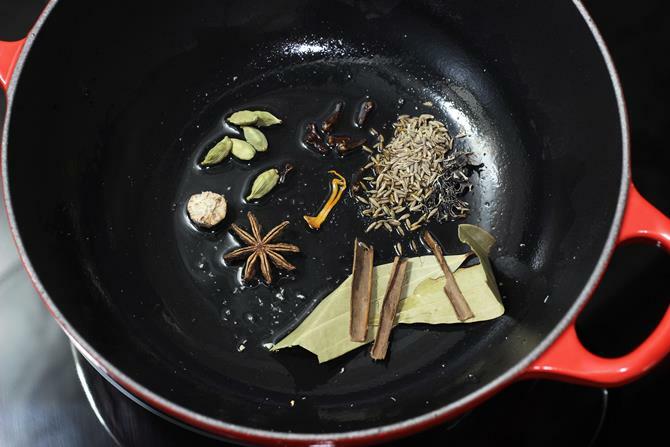 Then add cumin, cardamoms, mace, nutmeg, cloves, cinnamon, stone flower, bay leaf and star anise. Saute them for a minute. 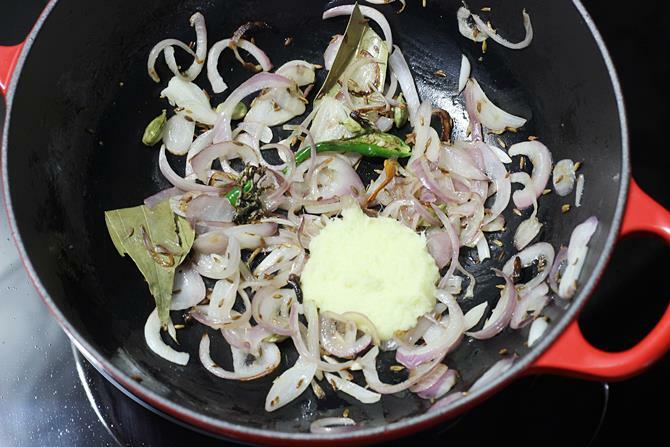 Add onions if using and fry until golden. You can also skip onions. Then add ginger garlic paste and fry until the raw smell goes off. Saute pudina or mint for 2 mins. Next add peas and rice. Saute for 3 to 4 mins. Pour water and add salt. Stir well and check salt. Add more if needed. The water must taste medium salty. For pressure cooker, cook for 1 whistle on a medium high flame. Turn off and remove from stove immediately. For al dente rice I release the pressure manually with a spatula. 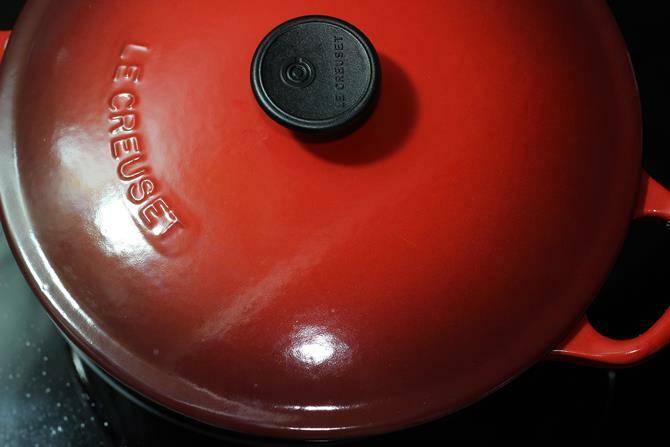 If cooking in a pot, cook covered on a low heat until the water is absorbed. Fluff up with a fork once done. Allow to rest for sometime. 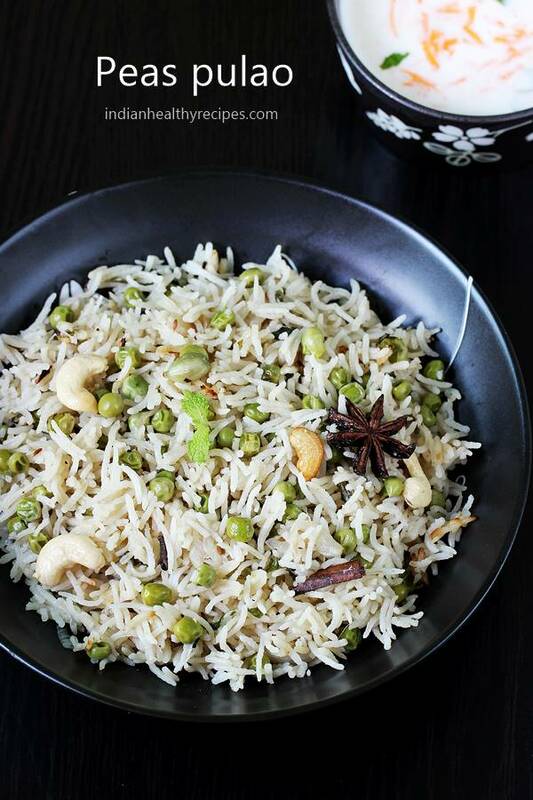 Garnish peas pulao or matar pulao with nuts. Serve with raita or a gravy. Instructions for instant pot below the recipe card. Adjust the amount of water as needed depending on the rice. I use aged basmati rice. I have shared a video on how to make matar pulao in pressure cooker. Here is how to make it in an instant pot. Pour oil to the inner pot of instant pot. Press the saute button and saute the spices for a minute. Then add ginger garlic paste and fry just for 30 seconds. 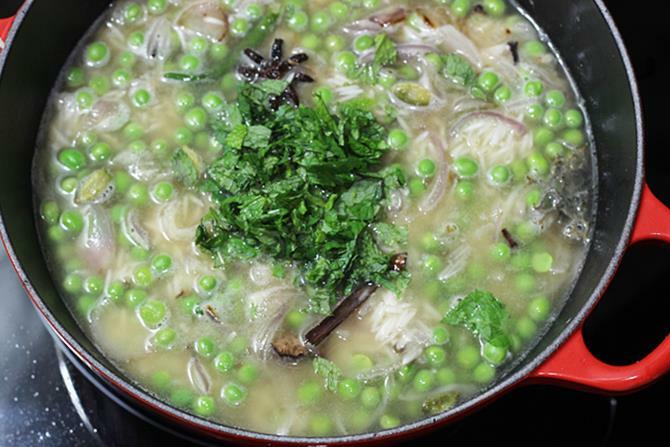 Quickly add in peas & mint leaves. Fry for 2 mins. I skip the onions for instant pot method. Add 1 ½ soaked & drained rice and pour 2 cups water. Stir in some salt & taste it. If needed add more. You can also fry the rice for 2 mins & pour water. Press cancel. Secure the lid of the instant pot & set the pressure release value to sealing. Press the pressure cook button (high pressure) and set the time for 5 mins. Once done. Press Cancel and switch off. Place a kitchen towel and do a quick release. Peas pulao is ready. Fluff up with a fork. 1. Wash 1.5 cups rice a few times until the water runs clear. Soak it for at least 30 mins. Drain and set aside. Slice 1 medium onion and slit 2 green chilies. Make a fine paste of ginger garlic. 2. This step is optional, you can also skip it. We usually prefer cashews in peas pulao so used it. Add 2 tbsp oil or ghee to a hot pot or pressure cooker. Fry them until golden. Set these aside to a plate. Ghee lends a special aroma. 3. To the same pot, add spices and saute for a minute or 2. 2 inch cinnamon stick. If using true cinnamon like me, you can use up to 3 – 2 inch pieces. 4. 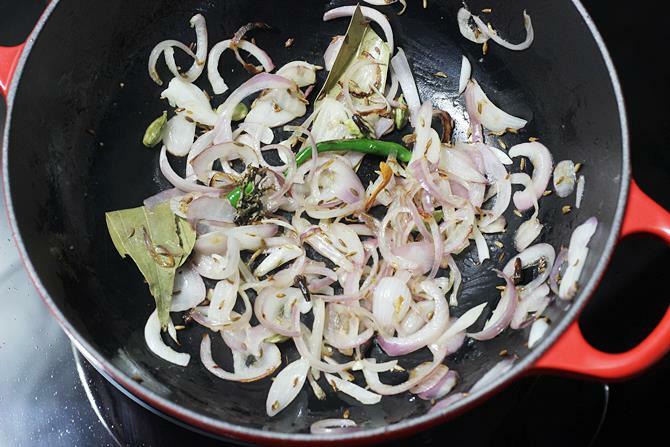 Add sliced onions and slit green chilies. 5. Saute until they turn golden. 6. Lower the flame and add 3/4 tbsp ginger garlic paste. 7. Fry until the raw smell goes off. 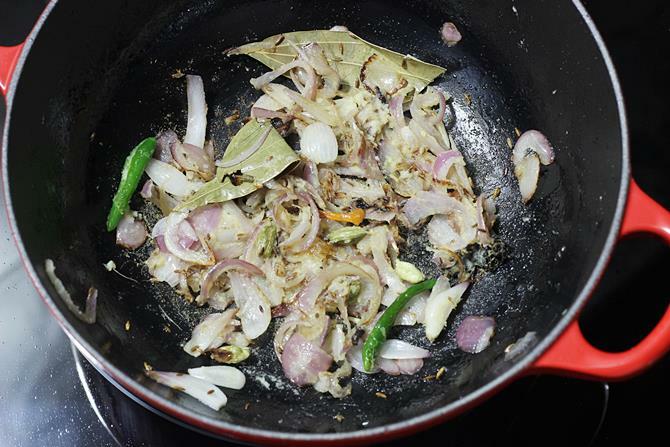 Add mint leaves here and fry for 2 mins. I forgot at this stage so added later. 8. 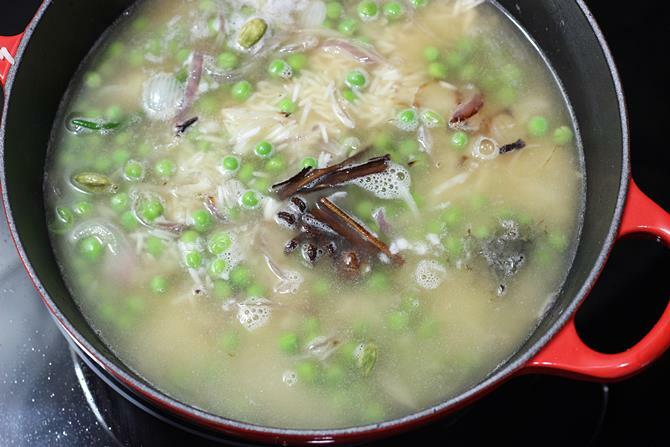 Add 1 cup green peas. 10. Saute everything well for 3 to 4 mins. Handle the rice gently otherwise grains will break. 11. Pour 2.5 cups water. If you are using rice from new harvest or sticky rice, you will need to heat water separately in a different pot and pour here. 12. Add salt. Stir and taste the water. It must be medium salty. 13. Add handful of finely chopped mint leaves. 14. Allow to cook on a low to medium heat until the water is almost absorbed. But it must be still soggy as you see below. 15. 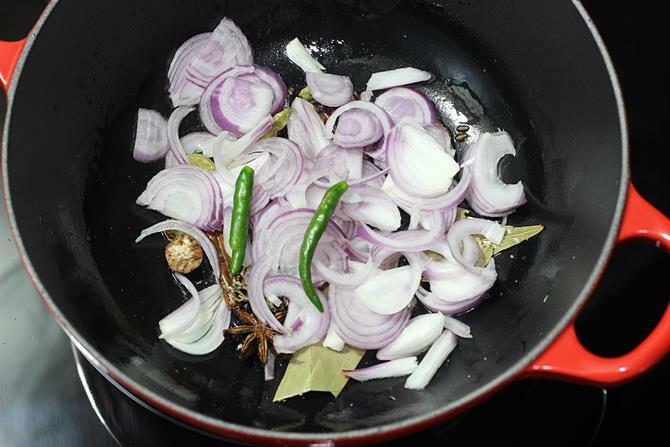 Cover the pot at this stage , lower the flame and cook for 5 to 7 mins. If using pressure cooker, close the lid and cook for 1 whistle on a medium high flame. Switch off the stove and allow to rest for a while. 16. Fluff it up with a fork. Garnish peas pulao or matar pualo with cashews just before serving peas pulao. Enjoy with a raita or gravy. Hi, made this pulao today without onion garlic. And it came out very yummy. Thank you so much for this simple n tasty recipe. Wow, look so tasty recipe.Will try this very soon. Amazing! Looks Tasty! Thanks for sharing. I am defiantly going to try this. I think rice should be of fine quality for this recipe to make it tastier. I always prefer to buy basmati rice. Great aroma and fine quality to make any recipe more stunning.